As we reported at last winter’s North American International Auto Show, Chrysler will couple a new eight-speed automatic transmission with the V-6 engine in its full-size sedans, the Chrysler 300 and Dodge Charger. Both cars were redesigned for 2011; these changes affect the 2012 models, which go on sale this fall. The transmission will have an electronic shifter like an Audi A8, with Sport mode and steering-wheel paddle shifters optional. All-wheel drive, offered only with the V-8 for 2011, will be optional with the V-6 and eight-speed for 2012. Rental-grade base V-6 trims and all V-8s carry last year’s five-speed auto and conventional gated shifter. We hit the evaluation track near Chrysler’s Auburn Hills, Mich., headquarters to drive two eight-speed V-6 prototypes: an all-wheel-drive 300 Limited and a rear-drive Charger Rallye. The Charger had Dodge’s new Blacktop Package, which includes 20-inch wheels and performance suspension tuning. Saddled with some 400 pounds more curb weight than a Toyota Avalon, Chrysler’s Pentastar V-6 and five-speed auto felt leisurely in last year’s 300, especially starting out. The 2012 car feels similar off the line, but get past 1st gear, and the eight-speed’s short ratios and smooth upshifts allow the Pentastar to crank out quick, successive dashes up the tachometer. 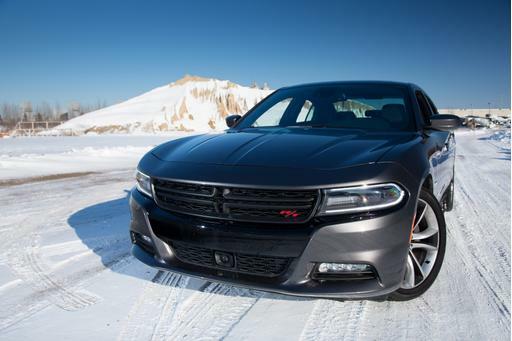 It makes the all-wheel-drive 300 feel adequate — while the rear-drive Charger, which is 239 pounds lighter, pulls strong enough to encourage rowdy driving.The Blacktop’s R/T-spec suspension helps, too. On the evaluation track, our test Charger cornered flatter than the tipsy, push-happy 300. Equipped with the same 2.65:1 rear-axle ratio as before, Chrysler estimates that the eight-speed-equipped cars will hit 60 mph in 7.2 seconds. That’s about “a half-second” better than with the five-speed and V-6, spokesman Jiyan Cadiz said. I couldn’t detect much difference from the Blacktop transmission’s Sport mode. Chrysler says it shifts faster and holds low gears longer, but around the track it didn’t behave distinctly. Most automatics resist midcorner shifts, which can be double-edged sword. Gear hunting can spoil any curvy road, and we’ve driven eight-speed gearboxes that do just that. But all-out refusals to downshift leave you wanting more power to claw back up to speed, especially with a smaller engine. Chrysler’s eight-speed held gears through much of the evaluation course, but a few more downshifts might have helped the Pentastar dig me out of the track’s S-curves easier. Optional paddle shifters allow shifting on your own, but eight-speed Chargers and 300s without them have no manual-shift provision. Tom McCarthy, chief engineer for the 300, said few drivers used Chrysler’s AutoStick, so the automaker dropped the feature with the electronic shifter. That shifter mirrors the A8’s boat-throttle design. Gears show up on a full-color gauge readout that looks much sharper than last year’s black-and-white display. Still, I prefer the gated shifter’s mechanical feel to these artificial detents. A point McCarthy sympathized with, but carmakers can shoehorn electronic shifters into spaces too miniscule for their mechanical counterparts, he said. No doubt the extra gears would improve the V-8’s 16/25 mpg city/highway EPA rating for the rear-drive Charger and 300. The V-6 saw a healthy gain: Last year’s cars were rated at 18/27 mpg, and Chrysler reckons both will rate 19/31 mpg with the eight-speed. That edges out large front-drivers like the Toyota Avalon, Ford Taurus and 3.6-liter Chevy Impala. Even entry-level luxury cars like the Lexus ES 350, Lincoln MKZ and Hyundai Genesis fall short — and the Genesis also has an eight-speed. Not bad, considering Chrysler’s sedans are heavier than all but the Taurus. Which 2015 Dodge Charger R/T Should You Buy?